I made it to day 60. Let’s pause because I think that’s a milestone. The average American school has 180 instructional days per year — I’m one-third of the way. I’m a teeny bit choked up actually. I hope I can continue with the project for the full 180 days. My stomach and taste buds are confused, but I think I have already made a small difference at least for the readers of this blog. Keep your fingers crossed that I can keep going (anonymously of course). So let’s get back to what I ate today. Popcorn chicken. After the chili and the meatball sub I had earlier this week (which I thought weren’t too bad), I should have seen this coming. I slathered the chicken bits with bbq sauce. When that wasn’t enough I randomly squirted ketchup all over them. It got very messy and so did I. It’s not that they tasted bad per se. It’s just that after I read that chicken nuggets contain roughly 50% chicken (and now I can’t find the citation), I struggle trying to get them down. Last week was pretty chicken-heavy (chicken patty and chicken nuggets) and I’m not complaining because I do prefer chicken over beef. It just seems like a lot of the same. There were two popcorn chicken bits that were fused together (see first picture). When I bit into them/it, I got a closer look at what is on the inside, I took a close-up shot. It sort of looks like mashed potato and not like chicken. I wanted to share that with you. It got me thinking about the students at my school walking home or playing outside or going to the store and if a parent or random adult questioned them, “What did you eat at school?” Again I think they might actually say, “I don’t know.” It is tough to say what that was. But. Bread and butter are simply delicious (I’m into comfort food). And the apple?! Thank you those in power who might be reading this (hi!). Um, a fruit cup might have put me over the edge. OMG, the tots and the popcorn chickens look exactly the same! Also, the chicken cross-section looks a lot like a tater tot cross-section! I think they are one and the same. Keep it up, Mrs. Q! Congrats on making it 1/3 of the way! And wow… apple aside, that is one very brown meal. I'd love to know the official nutritional score on that lunch when the menu was put together. It seems rather refined carb-heavy (potatoes, breaded protein and what seems like fairly light bread), and fat-laden (tater tots, nuggets and the butter on the bread). I just wish they would serve sliced apples. Kids would probably be more likely to eat them sliced up. Good job on your way, btw was that even chicken? 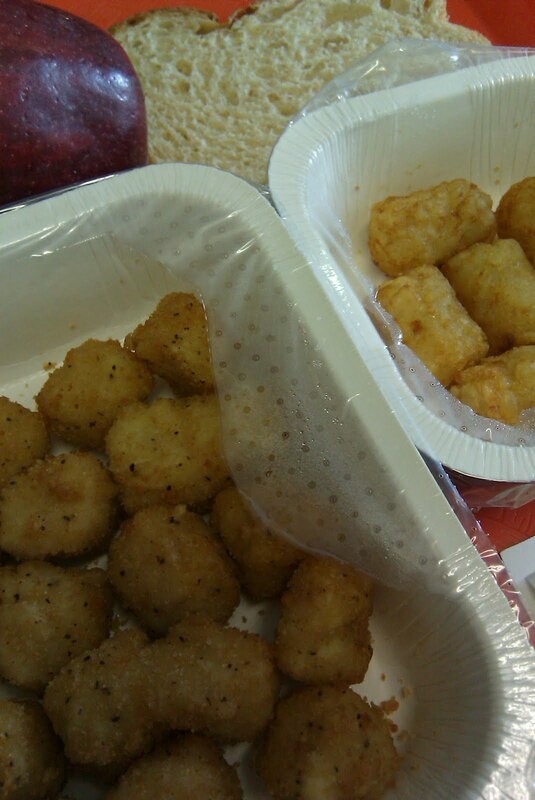 seriously, why do the tots and chicken look the same.. i ♥ tots, but the chicken is gross looking. how did you manage to eat it? At first, I couldn't tell the tater tots from the chicken. Yikes! Well… maybe the chicken in the jar I serve to my baby. I was thinking the same thing: two almost identical beige foods, some beige bread, and just the red apple for color. I wonder how complicated it would be for them to do a big fruit salad (real, natural fruit, no sugar added). Everything looks the same–chicken, tater tots, what's the difference, right? Ugghhhhh. I'm a new follower and I just love your blog and what you're doing. I would love to see some real food for the kids to eat (and maybe even more than twenty minutes to scarf this said "food" down). Congratulations on making it to day 60! I follow your blog and you are truly remarkable for taking on this project! I wish you well. I call most of the chicken stuff chicken sponge. Re: the difference between tater tots and chicken things is that the tater tots tended to have more texture, especially if they weren't cooked very well. Stepshep: You don't want them slicing the apple… the way this food is served they would have to add a preservative to keep it from turning brown. Whole apple is a lot better. I am a stay at home mom who homeschools my 3 wonderful children. When I first started reading your blog out of curiosity, I was blown away at the food. I never ate food like that growing up in my 13 years of public school. Everyday I look at those pictures and think "poor kids". I was just wondering about how your meals are prepared. Are you in a big enough district that they are made prior in one kitchen and then taken to another kitchen to be reheated. I couldn't help but notice how everything seems to be packaged and that really bothers me. Thanks for doing this as a preservice teacher it has really opened my eyes to cafeterias other than the I ate at growing up. Are these foods steamed or microwaved in the packages? I came upon your blog a couple weeks ago. Congrats on making it to day 60! This just re-instills my desire to make lunches for my daughter when she becomes school aged. When I was in elementary school (and even jr high and high school) food was nothing like this. The older grades (4-6) even had students that helped serve the food. This astounds me that it's become so mechanized. So what is the lunch lady now – just someone who opens the package I guess? I even remember that in junior high they had a salad bar every day available to those that wanted that – and not some skimpy little thing either – there were 4-5 dressings, and 10-15 fixins to put on top! My sister in law is a 6th grade teacher and said the food at her school is nothing like this – which is wonderful to know….now hopefully I stay here in Utah, even though our schools are so under funded. Thank you for what you're doing – this is such an important issue. I really enjoy reading your blog, but with this and the comments I wonder: How many of the moms gave formula to their babies and then started them off on food from jars (all nicely prepared foods from weeks or months ago)? And now are complaining that what their kids eat at school is all processed? How is this chicken any worst than the chicken in a jar one of the commenting ladies serves to her baby? Why be upset that the school ladies are just reheating? Why would the politicians change anything? Baby food sales are good, so it means that Americans like to feed processed foods to their children and find it acceptable that a carrot comes from a jar/package, so they get all confused why parents get upset that the school just continues this trend of convenience. I don't understand why it all comes in individual trays. I've never seen that in any of the school near me. If you're to just heat frozen food at least serve it up in a cafeteria-style presentation. There's no way I'd let my kid eat that that stuff. I feel bad for those who have no choice. @ Anonymous 4:56 AM — Baby food is one ingredient at a time (at least for stage one), just pureed. No preservatives, MSG, disodium guanylate, artificial colors… And some of us do/did make at least some of it at home. "Processed" is in many cases not exactly the issue; what parents really have a problem with is the *ingredients* that are part of processing of chicken nuggets, etc. I also thought the inside of the chicken was the tater tot. That's gross! Even McDonalds nuggets LOOK like chicken. Sad. Why would they give bread and butter with fried food? Shouldn't the breading on the food count for that? and YAY! an aple! It's about time there's fresh fruit! Congrats on making it this far, I love your blog and look foward to reading it every morning! My husband told me, many years ago while we were dating, that in the military that kind of meat was unabashedly called "chunked and formed" on the package. I've always felt that that's a pretty good description of processed chicken. I've heard that ketchup is classed as a vegetable in some districts. Is that the case where you are? It seems to be on the tray very often. Congratulations on making to day 60! I have two elementary kids of my own and I applaud your efforts. Thanks again for caring so much about our children! I also could not tell the difference between the tater tots and "popcorn chicken." That's really sad. These lunches are all very brown. Do you ever get sad not having any colorful foods? I think variety (greens, yellows, reds) in food just makes you happier. Also, something that tastes good, and/or is good for you would be great too! Good luck, congrats on the milestone! Have you seen Jamie Oliver's experiment where he shows the kids how chicken nuggets are made? *shudder* I will NEVER eat chicken nuggets again! My husband and I happened to have a big bag of chicken nuggets in our freezer and so we decided to have them for dinner Tuesday night, along with a salad. I ate about 3 bites and gave up because our nuggets looked about like yours did (but bigger). 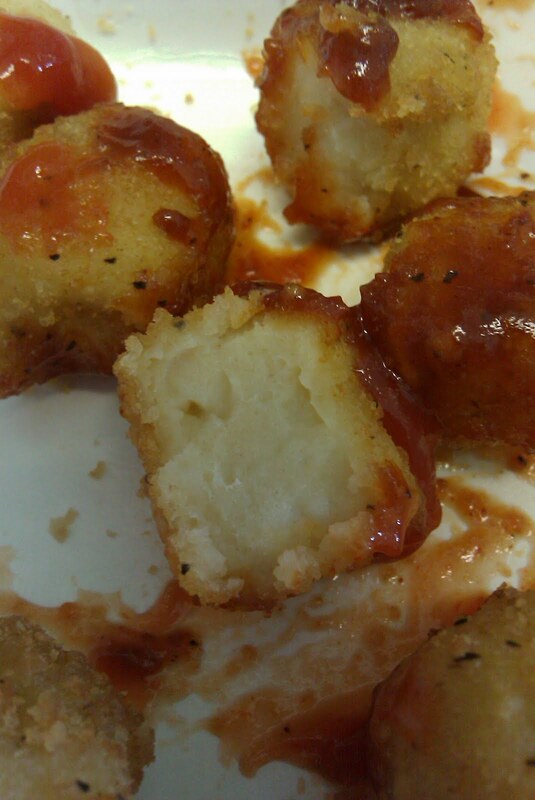 They tasted about that way too, and even slathered in buffalo sauce and ranch dressing, I abandoned them. Hubby stuck it out for 2 bites more than me and also tossed his in the trash. I honestly couldn't tell your nuggets from your tots either, and the comments about how very BROWN your meal was make a good point. Yuck! As a teacher, I have started paying much more attention to what my students have to say about school lunches since I started reading this blog. I haven't been brave enough to try it myself though! I find it hard to tell the difference between the tots and the chicken. Really, the stuff you are being served is a disgrace. I bet most of those apples got tossed in the trash too. That was one brown meal. I just got an email from my daughter's principal saying that next week is state testing and All the kids being tested are allowed to eat the school provided breakfast on the testing dates. I told my daughter and she made a gagging noise(she is 16). I want to know if the kids at your school are offered breakfast and if they are as bad as the lunches seem to be? These lunches look a thousand times better (and healthier) than the school lunch I grew eating in Hawai'i and the god awful crap I saw in some Chicago lunch rooms. I never eat school lunches (I'm a teacher), but I went on a field trip where they had packed lunches for us. The apple that came with our meal was the mealiest, most flavorless, toughest apple I have ever run across. I'd have taken the fruit cup. Yikes!!! How can no one in that school be bothered that the "Meat" and "Veg" look exactly the same? I think if I were you, Mrs. Q, I would weep everyday. Thank you for being brave enough to show this! Thanks for being so brave. I've been told repeatedly I am NOT to discuss lunches or I will lose my job. I'm a school nurse and we should have done blood work on you before and after. Thanks to you, Jamie Oliver, Michael Pollan and many many others I follow I think we might finally change things. I'd rather vomit than eat a whole year of school lunches. Like this meal most of them are brown and disgusting. Wow! Hats off! I am a new fan of yours. But I am concerned about your health: I hope you are doing some blood work to make sure that you control your risk … sounds absurd, I know, given the fact that we are feeding children every day like this, but in fact we know we are not exactly promoting health, just filling up and forgetting the taste of real, life giving food, and data speak clearly… please take care. Wow. I like breaded and fried foods, but seriously, breaded chicken (if that REALLY was what that was) nuggets, tator tots, and a slice of bread. NO COLOR! BORING! Your school meal looks a lot like the meals served at my school. I try not to eat there, but some days when I forget my lunch, that's the only option. Brown/white are the "in" colors this year, didn't you know? ;o) Two teachers in my school are trying to get things to change, but all we hear is "we can't because there's not enough money" or "The state says we can't do that". So much for trying. My 2nd graders are picking up on the "healthy" ve "nonhealthy" and are beginning to question me about lunches & breakfasts that are served. Very difficult for me to lie to them..so I don't. I tell them to go home and talk to parents about it, maybe that will get the district to change. I think someone should have the food "stuffs" analyzed by a lab to determine what's in it. (Your local College may have students happy to do this for free). Invite the President to have lunch with you and your students. Maybe then funds will be allocated for an "edible schoolyard" project (www.edibleschoolyard.org). I didn't see ANY grains with that meal which are very inexpensive to prepare. Was the bread at least multigrain? Was the toxic pesticide residue properly washed from the apple? No wonder kids are starving when they come home from school, they're being stuffed with stuffed~food~stuffs. Do they really heat/reheat the food stuffs in those plastic containers? It makes me feel the school administrators are uneducated and perhaps not qualified to make food choices for vulnerable growing children. It's common knowledge in 2010, that processed food stuffs causes ill health in humans. Thank You for bringing this issue to our awareness. It is shameful that the richest country in the world is unwilling to provide even one healthy meal a day to its most vulnerable citizens, the children, our future. Even prisoners are fed better then that. I hate my school lunches. They smell awful, the cheese looks fake, the steemed broccoli makes me want to puke, and above all, they will NOT SERVE BUTTER! It is crazy! They will serve us nasty ice cream that is very fattening, but no butter is crazy, so yes, that means when we have mashed potatoes, no butter! The lunch servers are rude high schoolers who save the unburnt food for them when they are done. I think one of the servers are practicly BLIND because she thought me and my black haired dark complectioned friend are sisters. I am pasty white with strawberry blond hair! One time my friend found a bumble bee in her food, another time a nail clipping, then worst of all a glob of hair! Hi, I'm the anonymous elementary school manager from the companion post on the Thaw-and-serve blog inside Fed Up With School Lunch. I'm here on this site because I think Jamie has the right idea. But as I see these comments and pictures I'm taken back a bit. 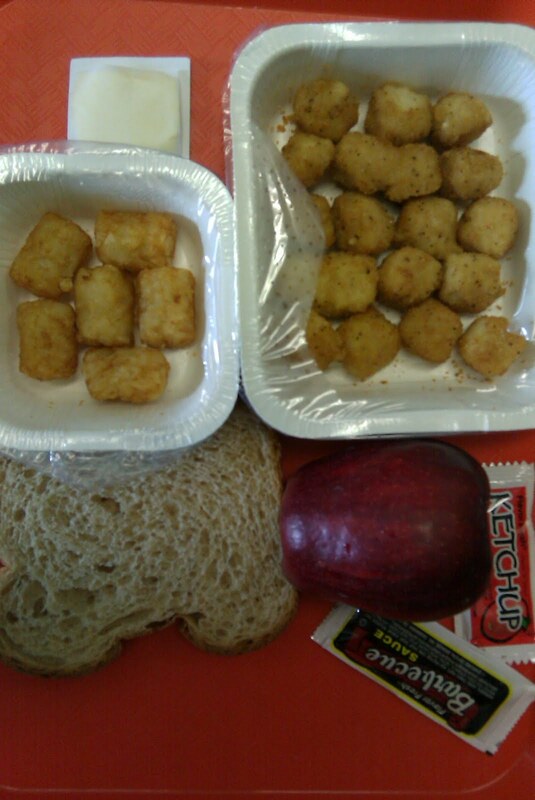 Why are all of the pictures of school food showing only unappetizing processed food in plastic reaheatable containers? Do that many districts satelite their food from a central kitchen? And does everyone think that the reason for obesity in America is the direct result of school lunches? Running through the burger joint on the way home from work & picking up the kids because you had a busy day and don't feel like cooking dosen't have it's consequences? (and that question goes to dad as well as mom). Or the poptarts the kids had for breakfast before school? Maybe the pizza rolls and cookies they had while they were watching tv or during one of their 5 hour computer game sessions had something to do with it? I'm not trying to divert all the blame but please remember it is not all from school lunches. And we do not all serve packaged reheatable food. Yes we do serve things like frozen pizza at my school and chicken nuggets. But along with these we always have a second choice and it is almost always an entree that we have made ourselves from a recipe. We make our own whole wheat rolls that are served almost everyday. Yes we do have canned fruit and veggies but most fruit and I think at least 30% of our vegetable dishes are made from fresh or frozen vegetables. Yesterday I admit we did have corndogs but we also offered spaghetti yes the ground beef we made it with was frozen and the tomato sause was from a can but the beef was lean and the spaghetti was whole wheat pasta. We also had wheat rolls, garden salad, frozen corn, cinnamon apples(made from canned sliced apples)and fresh fruit. The kids took the spaghetti 2 to 1 over the corndogs =). Today we had a choice between hamburger(frozen patty) or grilled cheese sandwich (reduced fat real cheese) and turkey & rice soup (from real whole turkeys). I admit we didn't kill & pluck them, they were frozen when we got them. The soup also had rice, frozen sliced carrots and fresh celery we also had frozen fries that we baked, burger salad(lettuce sliced tomato and 3 pickle slices), pinto beans(canned)birthday cake from scratch (we do have birthday cake twice a month),and fresh fruit (apples,oranges,bananas,and pears). Students do not have to choose between the cake or fruit they know they can always have the fruit as well. We steam or bake all of our food by the way. We do not own a frying pan. Tomorrow we will have "sigh" frozen pizza or tuna salad plate(canned tuna), rolls, fresh veggies(carrot,celery&cucumbers), broccoli with cheese sauce (frozen broccoli,cheese sauce was from a packaged mix) kids choose if they want the cheese sauce or not and frozen fruit shape ups(100% frozen fruit juice bars)and fresh fruit. Both adults & students have the option of ordering a chef salad daily. (no extra charge for the student salad, it meets all requirements for a reimbursable lunch). We feed 700 and average 20-50 orders for student salads daily. We are also in a poor, drug laden area, 97% of our students are on free lunch. We have good participation from our teachers and parents. I would love to have the time and man power to have made our spaghetti sauce from fresh tomatos and pass on the cheese sauce all together. I'm not saying that change is not needed in our lunches as well because it is. I just want people to know there are schools out here that do still make food from scratch. Wow… looking for content for my new blog. So glad my daughter carries her lunch to school every day. Her friends used to think she was silly (or we were mean) but now they are actually envious of her meals from home.